Mystery Musical Door Chime with Unique Mechanism. At first glance, this vintage doorbell is rather unremarkable. However, when you look at the mechanism, there is a sequencer unit underneath a metal dust cover. Underneath that housing is a unique sequencer to play a melody on the bars. This sequencer operates on a similar theory as the mechanical sequencer introduced with the late 1930s Rittenhouse Beverly. As with the Rittenhouse design, when the doorbell button is engaged, a single solenoid is activated which raises an eccentric contact attached to the solenoid plunge. 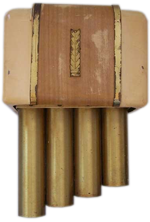 As this plunger returns to at rest, it momentarily closes the four individual circuits sequentially to trigger four individual solenoids which strike the tone bars to produce the melody. As with the Rittenhouse design, a spring regulates the velocity at which gravity brings the plunger back to the at rest position. 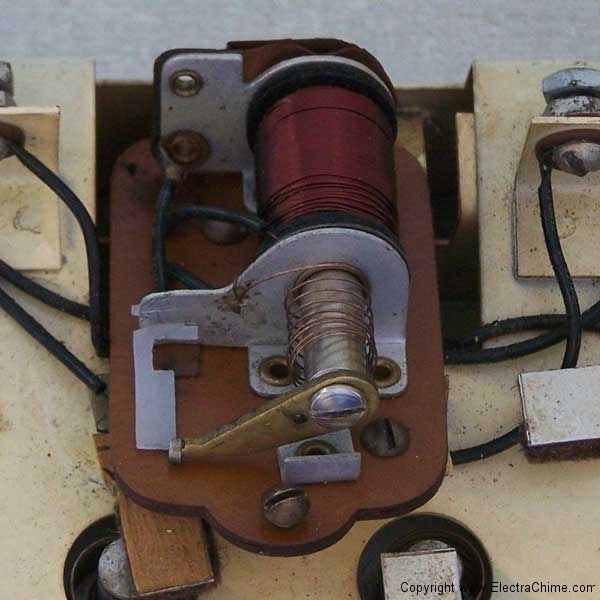 A small piece of hinged nylon prevents contact with the individual circuits when the plunger is raised so as not to cause a rapid fire of the tone bars. Where the Rittenhouse design was encased in an oil bath inside a sealed chamber with the oil acting to help regulate the velocity, this device was housed beneath a dust cover. 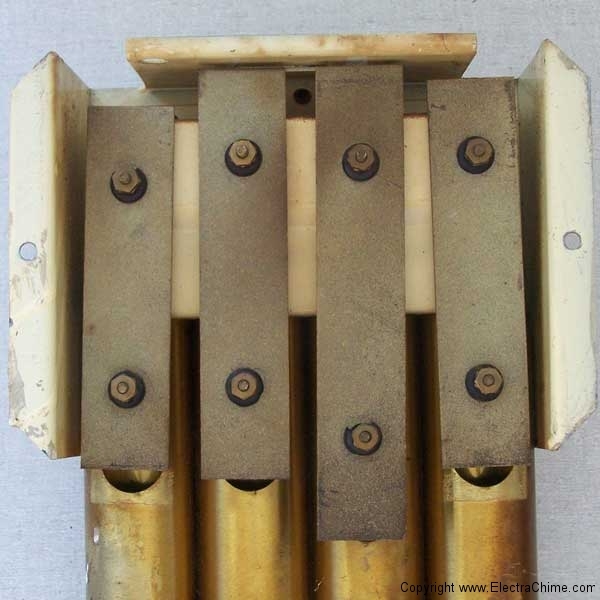 This chime came to the museum without any identifying marks, although a sticker was once attached to the mechanism as shown in the second gallery picture. 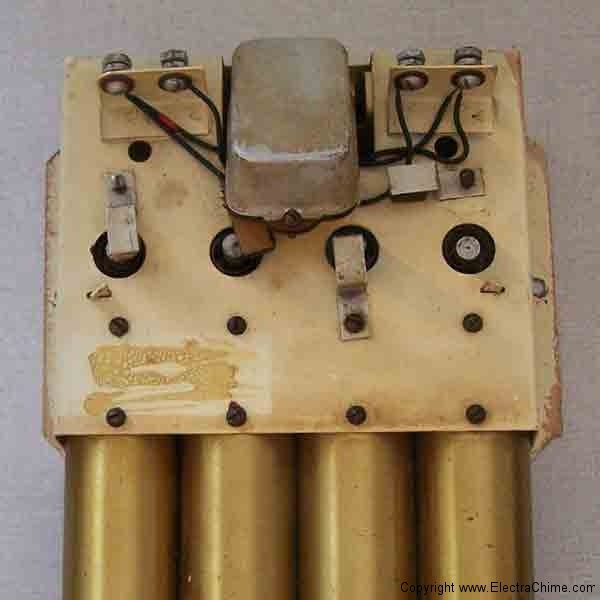 Please contact the Doorbell Museum if you have further information about this chime. 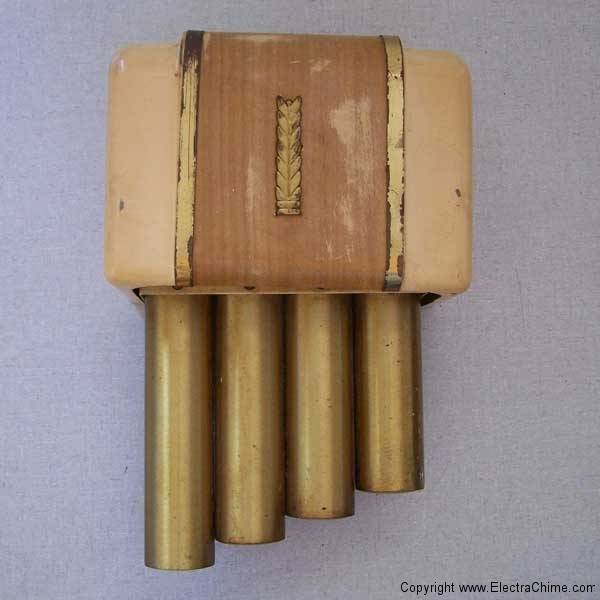 Materials Painted metal case with simulated wood grain, brass ornament, brass resonators, Iron tone bars.